The classic material used to make a moka pot is aluminum but these days stainless steel moka pots are becoming more popular than ever. The main reasons for this is that the price differential isn’t that big, stainless steel has far less health concerns over aluminum when it comes to cookware, and because steel can be made to conduct heat better than ever before. All that said what I like best about stainless steel stovetop espresso makers in relation to aluminum is that steel can be easily cleaned with normal techniques… like soap! 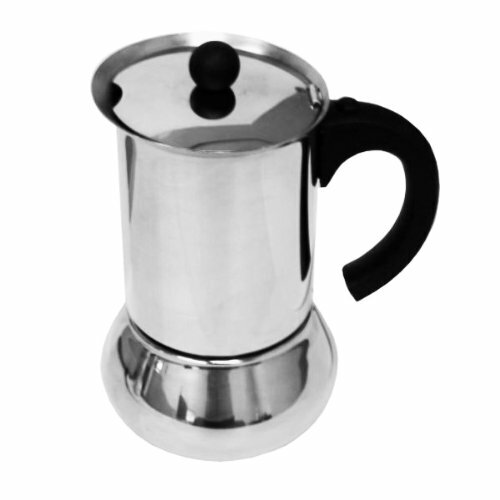 With aluminum pots like the best seller Moka Express, you literally just rinse the pot out after each use. This sounds awesome but in real world living it only works if you are able to rinse it off immediately. In the real world your Bialetti Moka Express will probably sit on the stovetop for hours after you drink your coffee before you get along to cleaning meaning all the grind will get crusty and kind of stick to the filter basket. In my home the pot can sometimes sit on the stove or near the sink for days before getting properly cleaned! When that happens you have to scrub it down because the oils do go bad after all and then your coffee is left with a metallic flavor that doesn’t go away until you brew a few batches. 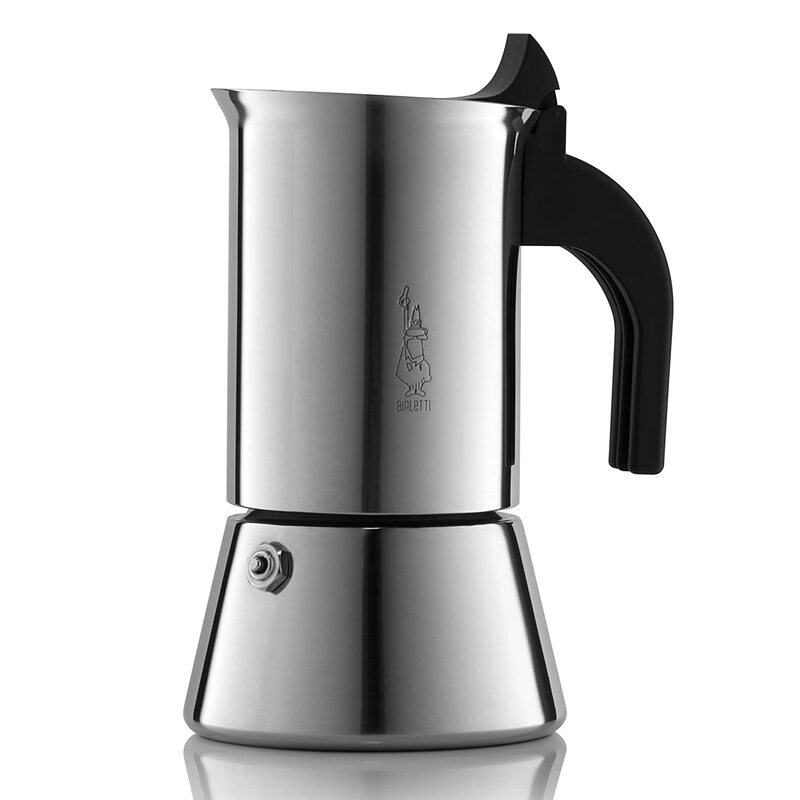 Bialetti has been making the Venus and the Kitty for a long while now so if you don’t want to deal with the aluminum problems and you don’t want to settle for anything but the Biealetti name then those are great SS options… but little known but to the most informed there are some other awesome brands that make amazing stainless steel moka pots. The premiere brand that comes to mind is Alessi. My favorite stovetop espresso pot is actually made by Alessi and it’s a 3-cup model that’s super easy to keep clean and never has a foul metallic taste. Alessi models are expensive, no doubt about that, but they are built like tanks and perform slightly better than other brands across the board. Even still, for people without the deepest of pockets there are a lot of good stainless moka pots to choose from that are worth your money. Below I’ve reviewed my favorite six stovetop mocha makers. Read through them, surely one will be right for you. 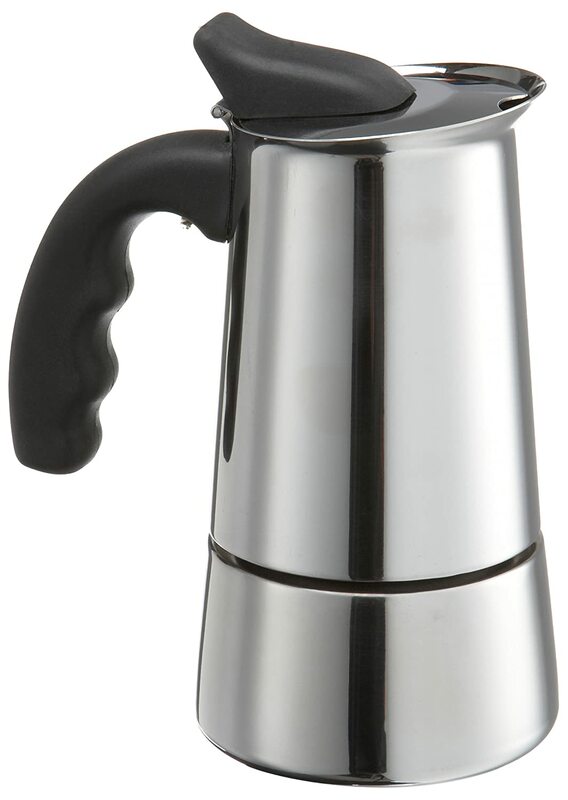 Naturally, there are a lot of steel moka pots that are available out there. So, you must be knowledgeable about the things that you’re looking for in yours, if you want to find the best one for yourself. Frankly speaking, buying the best one for yourself is actually way harder than it seems, because you have to do it a lot of proper research. 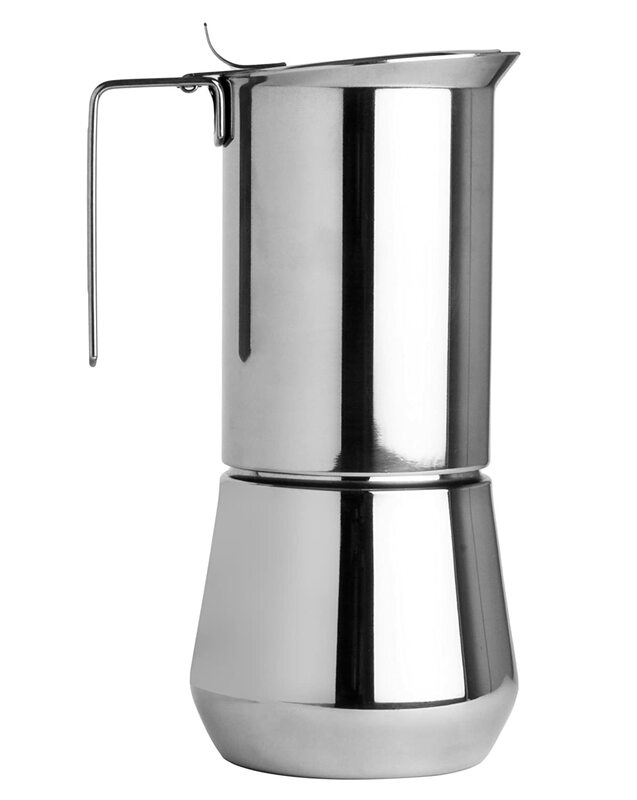 Bialetti has been a well known line of products when it comes to coffee making ever since 1933. Thus, this model comes from a brand that’s stood the test of time. The Bialetti 06812 Kitty Coffee maker is a beautiful stainless steel coffee maker. The main reason we decided to keep this model at the top of this list was because of how much all the users have loved this model. This model, according to people who have used it, is one of the strongest built models that you can expect to find. Made from 18/10 high quality stainless steel, the Venus Espresso Coffee Maker is one of the most well known and revered products in the market. This model is not only known for it’s unique looks, but also because of its durability and functionality. 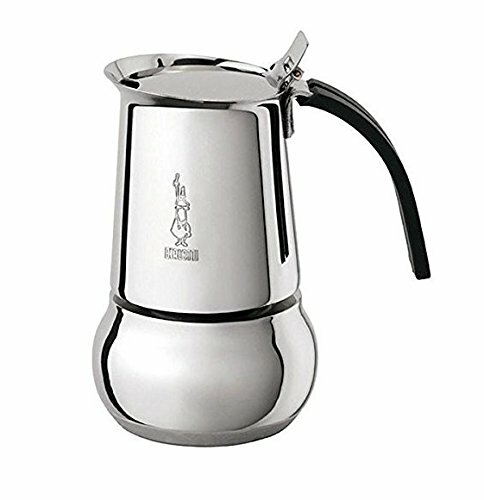 This 8-ounce model is, thusly, something that you simply must consider if you’re looking for a beautiful moka pot that’s made of stainless steel because its perfect size, shape and design make it fit on your tabletop or counter-top perfectly, as well giving your whole kitchen an entirely new and elegant look. Again, you might not always want to go for a large model. In such a case, AMFOCUS brings to you the perfect moka pot! 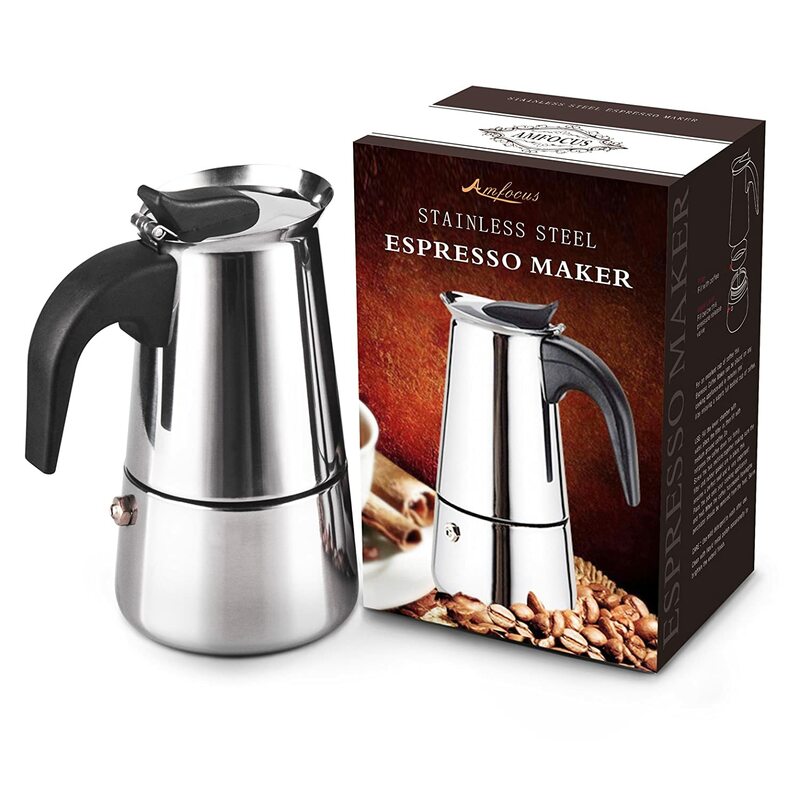 The AMFOCUS Stovetop Espresso Maker Stainless Steel Moka Pot is a really handy model with a capacity of about 2 cups, making it one of the best products, if you’re looking for a low capacity pot. This one is also really reasonably priced, making it one of those models that are great for a tight budget. All of these factors come together at the end of the day to make this one of those models that you simply must consider if you’re thinking about moka pots. Next comes the Primula 6-Cup Stovetop Espresso Maker. Just as the name makes clear, the model has a capacity of about 6 cups, which is around the typical capacity of 10-12 ounces. This model also has a good name for being pretty versatile. However, this does have some complaints too. One of these is that no one knows where these models are made. That’s something that seems to be concerning the amazon customers of this model. There are also some complains where its mechanisms are not working properly. These are actually really concerning and you might want to look up a bit more if you’re planning to go for this model, so that you can be sure that you get a pot that doesn’t need replacing within a few months. The Ilsa products are made in Italy, making sure that the best quality is maintained and they have one thing about them that people seem to be loving a lot: Everything except the silicone gasket is made of stainless steel in this model. Yes, you heard me right, nothing is made of anything else! If that doesn’t say QUALITY, I don’t know what will. This 3-cup capacity model has a beautiful look, the perfect size, and a super high level of quality and durability. Honestly, there’s not much more that we could ask for, right? And let us end the list with the Vev Vigano Carioca Nero 6-Cup Espresso Maker. This model might be called a slightly upper end model among the ones in this list but it’s actually well worth the price- I’ll explain why. This model has a polished high quality 18/10 stainless steel body. It has a stainless steel filter basket. It even has a safety pressure release valve, though made of brass. All of these things come together to make this model worth the price. So, if you’re not on a tight budget and can afford this model, I’d certainly recommend this one for just about anyone! Naturally, a stovetop espresso maker has a lot of factors that we must consider if we intend to select one to purchase. In order to do so, it’s important to first make ourselves acquainted with the factors. As such, I take it upon myself, as the host of this article, to make it clear to you which points were taken into consideration when writing this article. First and foremost, the fact that it has to be made of stainless steel in order to even be considered for a position in this list. Since that is one of the main things that list is compiled centering upon, it’s indispensable. Next comes the economic aspect. We have often touched on this during the article and we still feel like we should mention it again. Not all models are affordable for everyone and there’s nothing wrong with that. What is important is that you must be well aware about your budget and you must pick a model that fits it, perfectly. It’s not a good idea to settle for too less, as much as it’s not a good idea to opt for something that exceeds your budget too much. Another thing that really makes any model worth it is how long they are going to last. Yes, you got it, I’m talking about durability. Actually, any model’s price is always related to how long it’s going to last. If two models of the same price last for different amounts of time, then the one lasting longer is clearly costing you less. And, of course, capacity is one of the things we can’t escape considering. Everyone has different needs in terms of capacity and that’s why so many models with different capacities exist in the first place. So, it’s absolutely indispensable to take it into consideration when judging a model. Now, it all seems super simple right? Well, guess what? It isn’t! There are quite a few things that we can’t still judge for you because we don’t know your specific needs. Only you can know your needs, making it really important for you to judge for yourself. Keep in mind that the best model for you isn’t the best one out there, but the one that serves all your needs at the most affordable price. Now, a lot of questions might be popping up in your mind. And it’s entirely natural and within your right to ask me all the questions that you might have. But, since this is an article and not a conversation, I’m going to leave the answers to most of the questions that I can think of. However, should you have any more questions, feel free to contact me and ask me anything! After all, we are here for you and we aspire to help you in any and every way we can. So, please don’t hesitate to reach out to us if you have any questions at all! Moka is a type of coffee made in a similar fashion to espresso, but at lower pressures and with stovetop or electric coffee pots. We discussed the difference here. Except the capacity/size, not really. The whole mechanism is the same; it’s only the size that’s different to suit some specific needs in some cases. As I said earlier, this depends on what your needs are. Some people look for a convenient brewing feature, while others look for better insulation. 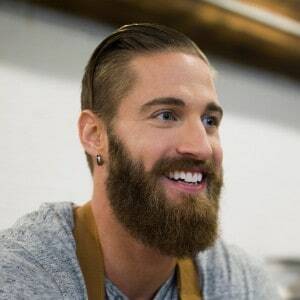 So, the best feature that you might look for varies with your needs, but keep in mind that there is a model dedicated to serving every need and you just need to search properly. At the end of the day, all these models are available out there and you can just go out and buy any of them right now, but that’s not all that there is to it. You must still remember that you’re buying the model for yourself and your needs matter. That’s the only way to ensure that you’re being a smart buyer and that you’re actually making a smart investment. It’s important to consider all the aspects before investing in a product, however minor it might seem in the first place- because nothing is truly minor in life.